Everyone loves the Fossil Lords - or at least they would if they knew they existed! You can probably guess which part of the combiner Ribcage forms (here's a hint - it isn't his foot!) but what else does Ribcage have to offer besides becoming a torso? Like all the Fossil Lords, Ribcage looks animalistic. In this case, his head is very squid-like. He looks a bit like a ninja, with a hooded quality to his face with big yellow eyes... but the rest of him is anything but lithe! I imagine the head needs to be small to be able to fit the combining gimmick around it, though it probably is a bit too small. The two combining pins either side of his head help set it off nicely though. Ribcage has a limited colour palette - he's primarily a dark blue, with only yellow eyes and silver claw tips to add any colour. Thankfully the molded detail all over his body (with the odd exception of his upper arms which are just smooth rectangles) help to offset this. It's pretty easy to tell which parts of him go where in his alternate mode... or would be if you knew his alternate mode was a torso with a pair of arms! As an action figure, Ribcage has an average amount of articulation. His arms and legs move and thanks to the transformation he has (useless) ankles, but his knees only bend sideways. Thanks to the massive bulk of his frame and tiny head he looks rather ungainly. It's also a shame that his tiny little arms don't reach past his chest! I am still undecided about whether the prototype colours are better. 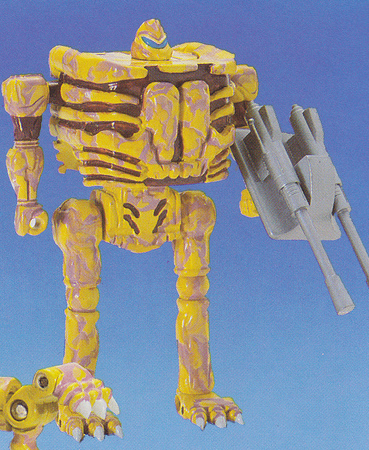 They would have probably helped sell the toy more, with a swirl of bone-like detailing, but personally I find the idea of a bone-coloured toy a bit icky, and would probably prefer something in strange and unrealistic colours like Ribcage is now! Of interest is that his prototype weapon looks closer to Hipbone's, he is missing the connector ports behind his head and his arms sculpts are more detailed. Ribcage's gun is absolutely massive! It's 9cm end to end, which is bigger than some Rock Lords. Why is it massive? Is he lacking in other areas (he does have tiny hands!)? Like Jawbone's weapon it has a mysterious angled stalk on the front which serves no purpose and looks like it should be used to combine with the other weapons or attach to the combined mode, but doesn't. It's also strange that he has to hold the weapon sideways on. The weapons of the Fossil Lords certainly feel that they had another function which for some reason never made it to the final figure. Does anyone out there have the answer? His transformation has its interesting moments. The hips pull out and legs turn into the combined mode's arms, and the chest pushes down, to hide the head and reveal the connector for the combined mode. The chest transformation is also his weakest part - in humanoid mode it is held up by rather loose friction alone. There is nothing to lock it in place, and thanks to the weight it wants to slightly sag down. It won't blow your mind to discover that Ribcage turns into a ribcage. Or a torso, at least. It has little play value on its own, but it's worth remembering that Tonka were planning on releasing the Fossil Lords separately. Yes, you could have bought your own individual ribcage. The prototypes were going to be decorated in a more bone-like style, and... maybe that would have given Ribcage more play value as an individual figure? Probably not though, it's hard to see the Fossil Lords as figures in their own right with the exception of Jawbone, as a skull feels more like a unique entity! Ribcage may be a figure with problems - he looks disproportioned, his transformation means his humanoid mode is not that stable, and he literally turns into a ribcage, but he's still funky enough that he merits interest. He is strange, but he's not boring, and it's that sort of weird and interesting stuff that keep collectors coming back for more! Shoulda put a picture of the head connected to him! Don't worry, the combined mode is coming! It is very exciting!